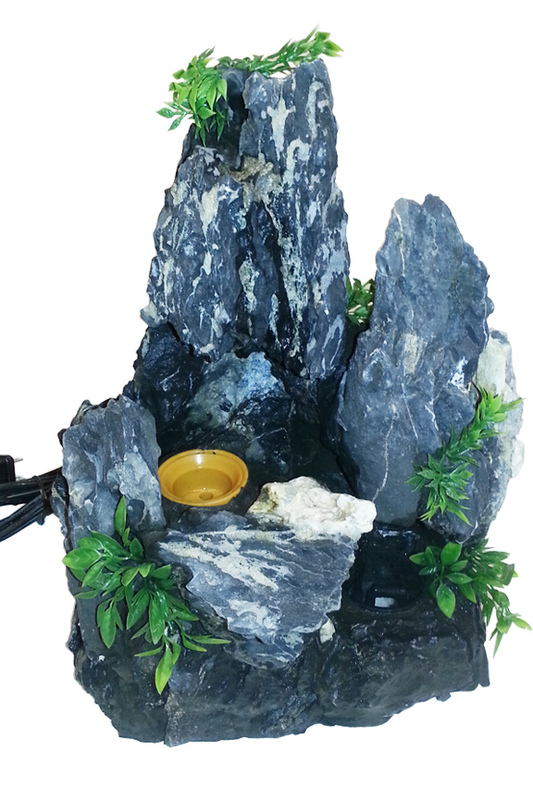 Create your own indoor fountain, or enhance the look of one you already have. 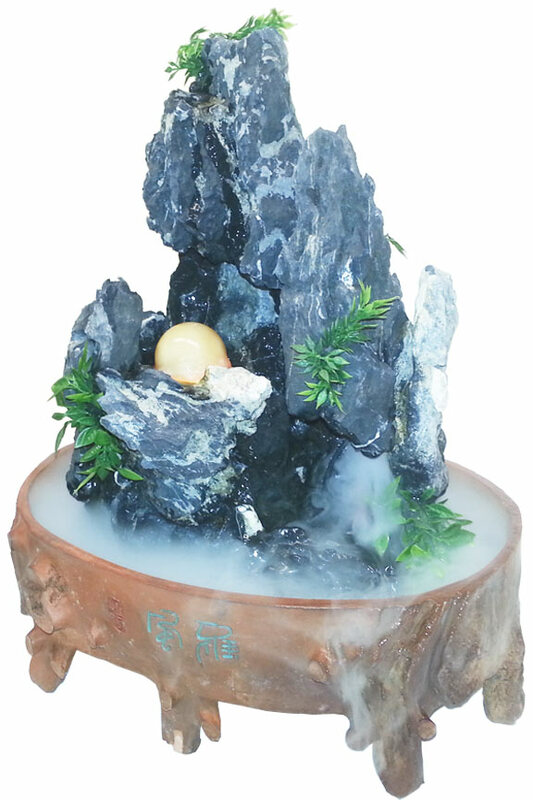 This natural looking mountain can be placed into any bowl of water, or indoor fountain because it is totally self-contained, and it will work in anything that it fits in. Just set it into the water, and plug it into a standard outlet. Once turned on, the water pump will pull water up to the peak to trickle down the rock face. The rest of the water flows underneath the lighted, glass ball to make it spin. Once it flows from there, it will fill the lower cave where the mister sits. This hole will quickly fill with thick fog that will begin to flow out, and float on the surface of the water. It is made from a durable resin, but it looks like real stone. Faux foliage appears to grow from the crevices, and detail in the stone adds authentic appeal. It comes complete with the glass ball and AC adapters for power. A high quality pump, and a powerful mist maker are pre-installed into the the rock for ideal placement, and fool-proof set up. With the addition of the mist, the gentle water noises will combine with added benefits like air purification, increased humidity, and odor elimination when you add scented oil to the water. PLEASE NOTE: This is the mountain part only. Any bowl or fountain would need to be purchased separately. Dimensions 7.5" x 8" x 12"
Bowl Material N/A - No Bowl Included. Ceramic Disc Life >5,000 hrs. A natural looking mountain that looks like real stone. Add to any bowl or fountain to enhance the look and add more intrigue. A mister, water pump and rolling ball combine to create a powerful display. Order Yours Today!